TakingPaws: One Well Behaved Dog??? One of the kids' most popular blog entries was from almost four years ago, One well-behaved dog is permitted.. That was when we were regular patrons of Red Roof Inns, one of the few motels that permitted dogs back then. Times have changed and it is becoming more common for pets to be allowed in the room, as long as they are, "well behaved." 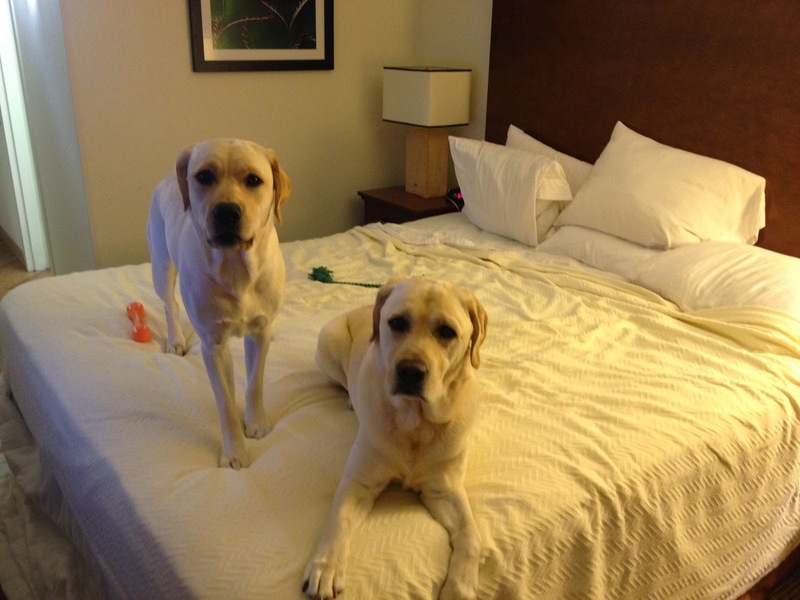 In recent years we have switched to La Quinta which also allows pets in the rooms. We have found the quality to be more consistent and unlike Red Roof, who allows only one "well behaved dog," La Quinta allows two. That means the aCappella crew no longer has to be in stealth mode. Last week, Dee Dee reached yet another of her firsts as a member of the aCappella crew. She spent her first night in a motel room. It also happened to be her first night in a king-size bed, something the whole crew enjoyed. Dylan was happy to be her mentor and both kids loved the La Quinta Bright Side Breakfast. Their dad made them fresh waffles! So how did Miss Dee Dee do? Well, we didn't get thrown out and there wasn't any large unexpected charges added to the bill, so we are calling it a success. You really can't blame a girl for a few barks here and there when people are talking while walking down the hall. And as for keeping Mom and Dad awake by running around the room half the night, well, she didn't know they made rooms that big - and she just has to run in all that space. We'll see what happens the next time we try to make a reservation. Do you think they have a banned dog list at La Quinta? At least we're not falling behind - we still have "one well behaved dog..."